“Pam builds some remarkable spiritual bridges in this book. She endeavors to reconcile the iconoclastic teachings of Murshid Samuel Lewis, the beloved (nominally Jewish, but aggressively universal) Sufi teacher of the San Francisco hippies in the 1960’s, with the knowledge and respect for Jewish form (in a universal context) that she’s picked up from Reb Zalman and other Jewish teachers. 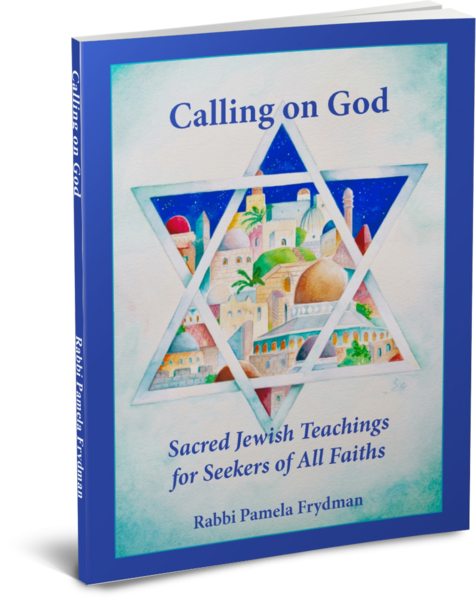 Although her approach to Jewish practice is informed by Jewish perspectives, it is also informed by perspectives drawn from Sufism, and from popular spiritual figures like Baba Ram Das, the Dalai Lama, etc. Regarding the subtitle… I suppose that some non-Jewish seekers may find this book a useful introduction to Jewish practices—some of them normative, some of them not. I think it will be most useful to Jews who are already oriented towards other spiritual traditions, and may be looking for ways to incorporate Jewish practice in what they do as well. On the other hand, more traditional or conventional Jews who are seeking to enliven their Jewish practice and shift to a more spiritual perspective, may find some of the practical suggestions in this book to be useful, even enlightening.” — Ya’qub ibn Yusuf, also known as Josh Heckelman, proprieter of Olam Qatan, a spiritual bookstore in Jerusalem, publisher of the Hebrew translations of HaDiwan by Jellaludin Rumi and Lev HaKabbalah (The Essential Kabbalah) by Daniel Matt; editor of The Essence of Sufism in the Light of the Kebzeh, by Murat Yagan. “I think Calling on God is a very important book for several reasons. Spiritually, Rabbi Pamela teaches us that we all come from the same source of life however we call it. Theologically, she brings out the teaching of Rabbi Zalman Schachter-Shalomi that there are many paths to the ONE. And politically, she reminds us that if we learn to listen to each other and learn from each other we can act together for the benefit of our world. In this time, many religious people are becoming more and more closed in their own thinking. The new world that is open for every path to emerge frightens them and they seek narrow borders. People are looking for THE right way. In Jewish tradition, we never have had only one path. We learned from our neighbors and, at times, we lived with them in peace together. Today it seems that some of our people have forgotten about this. This forgetting is dangerous and that is why Rabbi Pamela’s book is so important to open minds, hearts and neshamot (souls) to connect to each other.